The basic idea for Cranksgiving is pretty simple. Anyone wanting to organize a Cranksgiving-style race primarily needs to obtain a list of shopping items desired by a local charity. Once a list of needed products is acquired, a list of the local stores carrying those items has to be compiled. After both the lists are in hand determine what stores the racers should have to go to and what items the racers should buy at each location, then assemble them accordingly on a manifest master-copy. This determination should be chosen according to whatever manner seems appropriate depending on the desired complexity of the routing options and distances involved for the race. A number of the manifests for the Cranksgivings organized by Tone are available as examples through the "Manifests" link on the Cranksgiving home page. Once the manifest master-copy is finalized all an organizer needs to do is set a date, time, and location for the start of the race, then promote the event some way. Of course an organizer must also make enough copies of the manifest for all the expected racers. These copies will be distibuted to the racers a few minutes before the actual start of the race. Later on as the racers are finishing, they will hand in the store receipts from their item purchases. The receipts will prove a particular racer went to all the correct "checkpoints" and gathered all the right "packages". For this system to work all the stores chosen as checkpoint locations must produce receipts with the stores address, item name, and time of purchase printed on them. It is also very helpful to have the copies of the manifest printed directly on envelopes or taped to individual envelopes along with instructions for racers to write their names and/or racer numbers on them. This provides a single pouch for the racers to collect their receipts in, so all the receipts can be easily kept track of after the race. Naturally there is one thing still left to do after the race. The last element of Cranksgiving is donating all the purchased items to your local charity! Having the racers themselves particpate in the donation process is highly recommended. Even though one person may have won the race, having everyone involved in the charitable act of giving provides all the racers with a sense of accomplishment. If anyone is wondering, that is Tone in the photo at the top of the page. 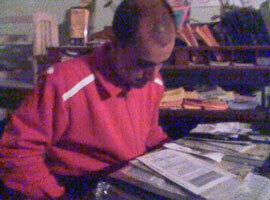 He is hard at work sorting through all the manifests to determine the winners after one of the Cranksgiving races. If someone out there would like to establish a Cranksgiving race in their own town, Tone just has a few requests before any potential organizer uses the "Cranksgiving" name. First of all, competitors must use bicycles as their only means of transportation. After all, why would you call it "Cranks-giving" if cycling was not involved? Secondly, no entry fee or registration charge should ever be collected! The point of the race is for charity, so anyone running the event should be doing it out of the kindness of their heart. Besides, the items racers purchase during the course of the race could be considered an entry fee. The last and probably the most important request is everything people buy along their routes should all be donated to a local charity.